Iran is ready to resume unconditional negotiations on the standoff over its nuclear program, its Foreign Minister Manoucher Mottaki told diplomats in Havana, Non-Aligned Movement delegates said Wednesday. "In response to the call by the NAM, the Islamic Republic of Iran has also expressed its readiness to resume the negotiations without any preconditions with the interested countries to clarify outstanding issues with the purpose of increasing confidence and transparency," delegates confirmed Mottaki said in a closed-door foreign ministers' meeting, in his speech obtained by AFP. Mottaki also told his colleagues that Iran "has continued its cooperation with the agency (International Atomic Energy Agency) to facilitate the resolution of the outstanding issues related to its peaceful nuclear activities within the framework of the agency." The Iranian chief diplomat said NAM colleagues had voiced solidarity with Tehran on the nuclear issue. "NAM through this support has rejected the efforts by some to limit and restrict the inalienable right of states to develop and use nuclear energy for peaceful purposes," Mottaki added in his speech. Egyptian Foreign Minister Ahmed Aboul Gheit told reporters "Iran is allowed to possess nuclear technology. The NPT offers them the right, for peaceful uses." He added that the NAM had received "very strong assurances that the objective is not nuclear weapons." "We have to believe them until it is established otherwise," the Egyptian said. "The important thing for the world community is to convince Israel to relinquish its reliance on nuclear weapons." Meanwhile, in Washington, Secretary of State Condoleezza Rice said foreign ministers from the six major powers involved in the nuclear standoff with Iran will meet soon in New York to discuss imposing sanctions against Tehran. Rice will be travelling to New York next week for talks on the sidelines of the United Nations General Assembly and she said this would be the opportunity to press ahead with the sanctions if Iran continues to reject demands it freeze its suspected nuclear weapons program. In Vienna, the United States and Europe earlier urged Iran to choose negotiations over UN sanctions, even as EU-Iran talks on Tehran's refusal to heed demands that it suspend uranium enrichment stalled. A meeting planned for Thursday between EU foreign policy chief Javier Solana and Iran's top nuclear negotiator Ali Larijani was postponed and only their aides will meet in Paris, Solana's spokeswoman said. 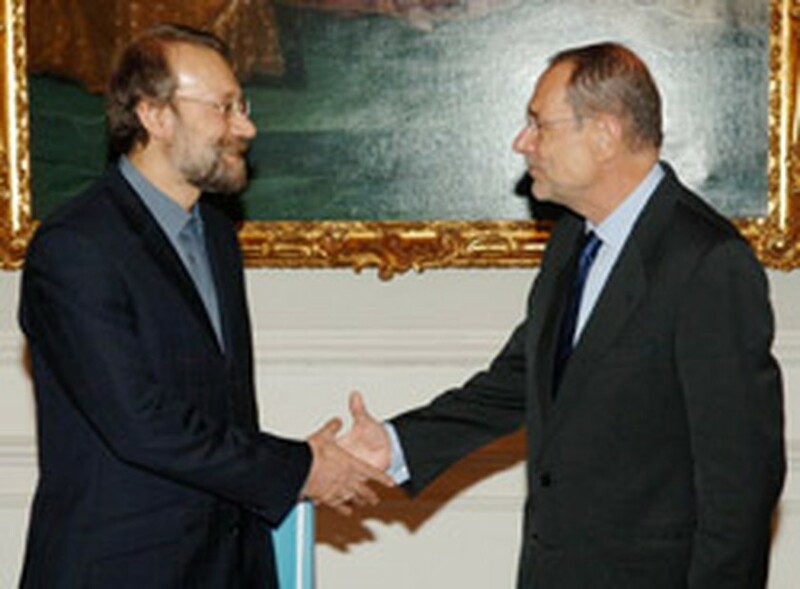 Solana and Larijani had held talks dubbed "constructive" over the weekend in Vienna, raising hopes that they might lead to formal negotiations between Iran and six nations seeking a way out of the nuclear crisis. At a meeting in Vienna of the IAEA, the UN nuclear watchdog, US ambassador Gregory Schulte urged Tehran to "make the right choice and avoid the consequences" of UN action should it continue to refuse to halt its enrichment activities. The United States, which charges that Iran is hiding secret work to make nuclear weapons, is pushing for UN sanctions against Iran for failing to honor a UN resolution that set an August 31 deadline for Tehran to halt the enrichment activity. Iran says its program is for peaceful energy ends only.